Initially this response focused on areas of Eastern and Central Europe, where winter months plummet and remain below freezing for sustained periods of time. Coats and blankets, along with hats, scarves and gloves are collected from the public (and several companies) in the UK and given out directly to children who are too poor to afford these things. Distribution teams, consisting of people from all walks of life, help to give these things out as a way of us making sure the aid reaches its intended destination (the children who need it most). Packing week is July 13th – 16th at Chilwell School 6th Form (Nottingham UK). We would be grateful for extra volunteers to come and help out during the day. There are other opportunities to help us in the lead up to this week. Feel free to get in touch if you would like to volunteer. In addition to helping children in Europe, Operation Orphan has sent aid to Syrian refugees who have escaped Syria and are living in poverty in the neighbouring country of Jordan. Clothing and uniform has been given to our Ebola orphans we care for in Sierra Leone as well as those affected by the Nepal earthquake. Currently in Nepal, aid from other countries is sitting in containers and lorries at the border and in the airport, unable to make it to where the need is greatest. We are not planning to add to this back-log but instead to send more aid when the pathway is clear and we can guarantee it will reach the people. 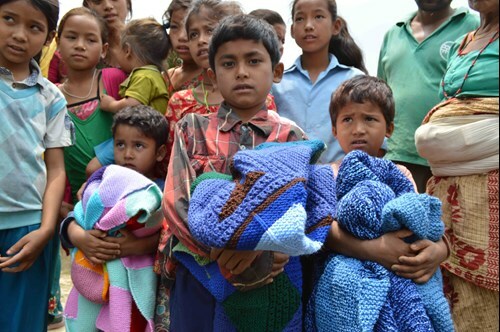 For now, the greatest thing we can do to help Nepal earthquake victims is to provide them with a sturdy shelter for the Monsoon season – please read the blog to find out more on this or CLICK HERE to make a donation. This year we plan to send warm clothing to Moldova and Ukraine. A distribution trip for Moldova has already been arranged and the plan is to help children living in some remote, impoverished villages. Last year was a huge success but showed us that the need is greater, so this year we plan to visit again and make a wider impact. Figures from the beginning of this year suggest that there are 8 million children living in Ukraine, 100,000 of these children are orphans. Out of this huge orphan population, 30,000 are in need of adoption. Unadopted orphans who live in governmental orphan programs have a very low chance of success in life. Statistics show that only 16% build their own families, 25% are employed, only 1% will obtain a higher education, 14% have attempted to commit a suicide. Every fifth former orphanage child becomes homeless and every second orphan gets in trouble with the police. These numbers cry out for action! Behind each number there is a REAL life of a REAL person. 30,000 little ones in Ukraine live their lives without knowing what it is to be special and dear to someone. We would like to put our efforts into forming great partnerships in Ukraine and showing some kindness to those children who feel without hope. Thank you to all the UK schools, groups, companies and individuals for becoming collections sites for donations. Huge thanks also to Chilwell School for your on-going partnership. If you are reading this and would like to recommend us to a school or group you are in contact with, please email info@operation-orphan.org – we would love to hear from you.